My gun. Pretty sleek, huh! We went shooting last night. I know, "Hippies aren't really into guns." Historically they have been peaceniks, and pacifists, and anti-carry. But this barefoot hippie loves her gun! 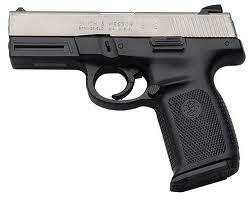 It is a Smith and Wesson 9mm. Very nice profile. The barrel is steel, and the thing you hold onto is black. What is that called? The grip? I don't know. Anyway, it is a powerful sucker. Quite the recoil! And, I can now tell you from experience, that ejected shells are hot (HOT). I got hit on the collarbone twice, and I have a blister to prove it. I feel like I am getting used to my piece, and my accuracy improved this time over last time. We have a bunch of ammo to use, so we will probably do another shooting date soon. Last Saturday was not as restful as this one. We met with an architect about some ideas for our church building. He said that a lack of money should not be what we are considering at this point in time. And he shared a story about how God can provide. A church they recently did a project for had an amazing story about how they raised a chunk of money. One Sunday one of the men got up and said that his gold watch chain had been weighing him down, and he felt God wanted him to give it to the church. And then he placed it in the offering plate. And then someone else, and someone else, etc., got up and put pieces of their jewelry in to the offering plate. Pretty soon the plate was over-flowing. They sold all that jewelry, and had $100,000 for their building project. Well, I told Mr. Hippie that would never work for our church. I'm about the only one who wears jewelry. I don't think anyone is against it, nor is anyone too poor. But wedding bands, and small earrings, and modest necklaces are fairly standard fare. Except for me. Miss Bling-bling herself. I have rings, and earrings, and bracelets, and anklets, and toe rings, and necklaces. I love wearing my jewelry. I like how it finishes an outfit. It makes it look like I put some effort into my appearance, not just slapped myself together. I actually have jewelry on all the time. I have never taken my toe ring off, and my other rings come off only for cleaning. That's it. My newest piece is a stackable looking ring that I have for my thumb. Its really cool. And then I have my dangly pinky ring. I think dangly jewelry is fun. A pastor's wife friend of mine, thinks I am a bad influence on her, with my toe rings and such. She just doesn't even know. One of these days I am going to give her her own toe ring. And her husband will roll his eyes. (faithful blog reader, you know who you are.=)) Mr. Hippie has given me a couple nice bracelets the past few years. I don't wear bracelets as much-mostly just for dress up-when I am pulling out all the stops. For my necklaces and earrings I vacillate between the big costume pieces and the smaller genuine pieces. It depends on the outfit. But all of those pieces are precious to me-costume or not- because of the people who thought to give them to me. Anyway, I have had many jewelry influences that have cultivated this love of mine. My Aunt Saralyn, with her shoulder length hoop earrings. When I was very young it was my wish to have earrings just like Aunt Saralyn's.=) Now its just not practical-grabbing babies and all. But that hasn't precluded my wearing of bling. And then my mom had two jewelry boxes full of jewelry, which to me were like treasure boxes. I thought all her stuff was so pretty. Her locket that dad gave her for their wedding. Her pins, and earrings, and row of hanging necklaces. And then there is my friend Mary. She clinks-with gold stacks of bangles. It is her signature. And while I don't wear bangles, I never think of her without thinking of how she influenced my style too. And my other friend Beth. She cruises and buys showy pieces of jewelry inexpensively on different islands. I love her pieces. And it has inspired me to wear bigger pieces too. Things I never would have worn before. And we must not forget my toe ring friends, who encouraged me to try them, because I would like them. All these women have contributed a facet to the jewelry "style" that is me.